Confessions of a Frazzled Teacher: How I Keep My Sanity! How I Keep My Sanity! This month has been extra stressful for me. First, I had my sister's baby shower to help plan and host. This was nothing compared to boxing up my entire house. Did I mention I was moving (1 week from today)? Probably not. I am trying to block it out as much as possible. This is hard to do though since I am surrounded by boxes. So how do I stay sane (or at least as sane as I possibly can)? I have Tuesday School Free Evenings. Tuesdays are my day to leave school right at 3:00. I bring no work home. I don't even pretend that I am going to do some grading. Since leaving school, I have gone grocery shopping, gone for a walk, made dinner, and am currently baking apple bread. Yummy! It's refreshing not having to think about school. To keep avoiding school, enjoy my quick comfort meal below - aka my dinner! 3. Spray a pie pan with cooking spray. 4. Place all the biscuits on the bottom/sides of the pie pan. Press the edges together to create one large biscuit. 5. Add the taco seasoning to the meat as the package recommends. Drain any excess water/fat. 6. Pour the meat evenly on top of the biscuits. 7. Bake 20-25 minutes. The edges should start browning. 8. Top with cheese and put back in the oven another 3-5 minutes. Eat with salsa or add a layer of salsa under the cheese. 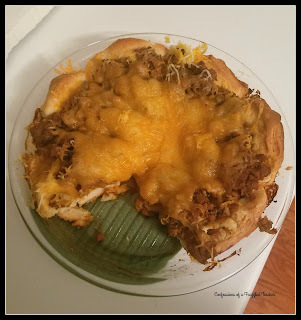 Sometimes I spread salsa or extra taco seasoning under the ground beef. Hopefully I have distracted you from all thoughts of school. 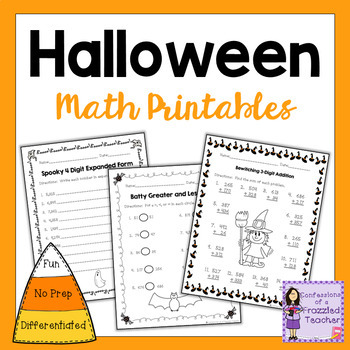 If you are still feeling overwhelmed and need to do some school work, download my No Prep Halloween Math Packet by clicking the pic below. Now you can say you did some school work!